Colonizing Mars may require humanity to tap into its inner bear. Researchers are working on ways to induce a hibernation-like torpor state in astronauts — a breakthrough they say would slash costs and make the long journey to the Red Planet safer and far less taxing for crewmembers. "We're not going to colonize Mars, or really settle it, sending four or six or eight people at a time every two years; we're going to have to send larger numbers," principal investigator John Bradford, president and chief operating officer of SpaceWorks Enterprises in Atlanta, said last week at the 2016 NASA Innovative Advanced Concepts (NIAC) symposium in Raleigh, North Carolina. "I don't know any other way that you're going to send hundreds of people to Mars." With current rocket technology, a one-way trip to Mars takes six to nine months. That's a long time to keep astronauts alive, healthy and happy, Bradford said. He and his team think there's a way to ease this journey — lowering astronauts' body temperatures by about 9 degrees Fahrenheit (5 degrees Celsius). This would induce a "hypothermic stasis" that cuts crewmembers' metabolic rates by 50 to 70 percent, Bradford said. "That reduces the need for consumables in both nutrition and hydration, [and] oxygen demand," he said during the NIAC talk. "That translates to mass, and mass is a critical item trying to support these Mars missions." Allowing astronauts to more or less sleep through the long trek would also minimize the psychological and social challenges of a crewed Mars mission, Bradford said. Bradford and his team have received two rounds of funding through NIAC, a NASA program that seeks to encourage the development of potentially revolutionary space exploration technologies. The researchers don't think any huge leaps should be required to make their vision a reality. They're not shooting for a sci-fi-like "suspended animation" state; rather, they seek to leverage the "therapeutic hypothermia" that's already common practice in hospitals around the world, often as a way to help people recover from traumatic injuries, Bradford said. "We're trying to pull on this technology that's already in use," he said. Crewmembers would be fed intravenously and catheterized; they would also be "lightly restrained" within the habitat to prevent them from floating around, Bradford said. Extended exposure to microgravity conditions has a variety of negative health effects, from muscle atrophy and bone weakening to vision problems. 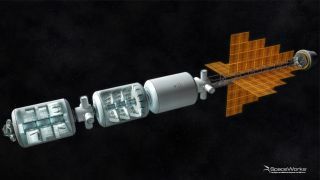 But torpid astronauts wouldn't have to worry about such issues, because their habitat would be rotated, generating artificial gravity on board, Bradford said. There are some inherent challenges in the torpor approach, of course. For example, while the process of going into hypothermic stasis is relatively rapid, waking up from such a state appears to be quite slow; research suggests that body temperature can be safely raised by only about 0.9 degrees Fahrenheit (0.5 degrees Celsius) every hour, Bradford said. And it's unclear just how long the recovery process would take, or what the long-term mental effects of prolonged hypothermic stasis would be, he added. In addition, significantly cooling the body suppresses immune function, so torpid astronauts would likely be more susceptible to infections. But Bradford and his team are attempting to address such issues via their NIAC-funded work, and they haven't found any deal breakers yet. "It's all manageable," Bradford said. "We think this is a very promising approach." The key to Mars colonization? Bradford and his colleagues think such torpor tech could not only help get astronauts to Mars (which NASA aims to do by the end of the 2030s), but also allow humanity to establish a permanent colony on the Red Planet. Settling Mars would probably require sending about 100 people there at once, the researchers wrote last year in a study outlining their approach. "The first settlements at Plymouth Rock and Jamestown, for example, started with 102 and 104 settlers, respectively," they wrote. Launching that many Mars pioneers in the standard fashion would require 17 six-person habitats, with a total weight of about 700 tons. But that could be reduced to 200 tons by putting the settlers into hypothermic stasis, the researchers argued. Their plan calls for building a "Mars Transfer Habitat" employing three habitat modules, two of which would hold 48 dormant colonists apiece. The third (much smaller) module would house four fully alert settlers, who would act as "caretakers" and keep everything running smoothly. "The reduced metabolic rates that are achieved through torpor relax the mission requirements on consumable food and water, and positively impact the design of the habitat environmental control and life support systems," they wrote in the study, which was presented at the 66th International Astronautical Congress in Jerusalem last year. "Overall, the application of long-duration torpor for humans to space exploration missions appears to be both medically and technically feasible, and shows great promise as a means to enable settlement of the solar system," the researchers added.